Hey everyone! My name is Allison. I'm from the Detroit area and I love the art of body modification. Hey everyone! My name is Allison. 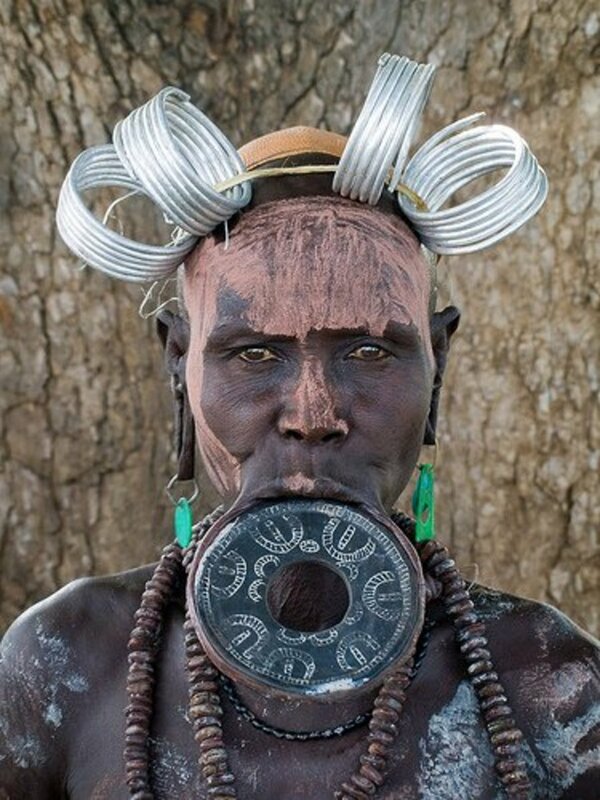 I'm from the Detroit area and I love the art of body modification. Above you'll see me... and my beautiful ears. 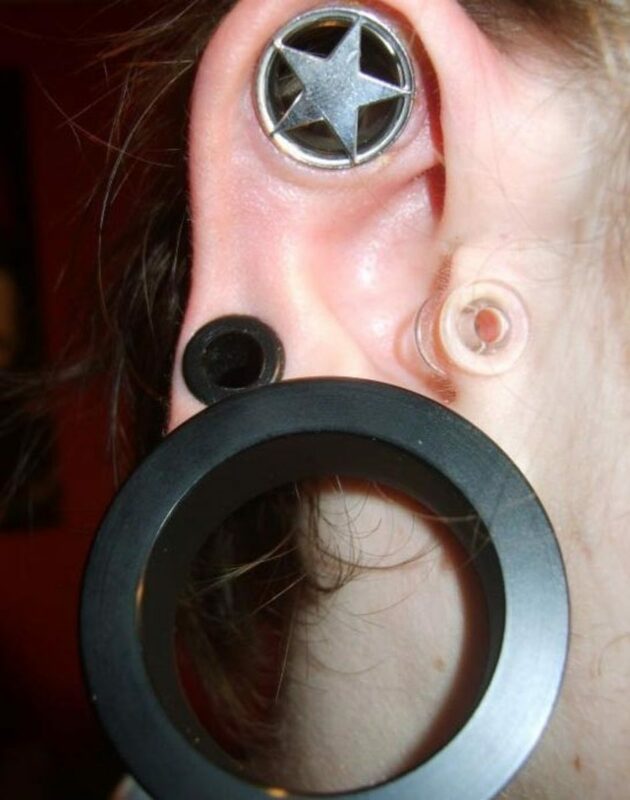 If you have stretched piercings, you're probably familiar with what is available on the market. Or you might not be! Whether you're new to stretching or a seasoned pro, I've got details on some of the best types of jewelry to wear in your stretched ears! Silicone - Kaos Softwear is a company that makes silicone plugs and eyelets. 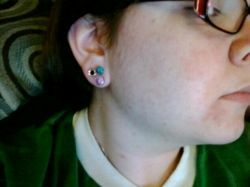 The really cool thing about silicone plugs is the fact they're SQUISHY! These plugs are pliable in your hands and can be folded to insert in your ear. Once in your ear, they pop open and keep your holes open. Silicone is porous, so they should be oiled before they are inserted. You should also oil them every day while wearing them to be sure they don't stick to your ears! Wood - It is a great organic material, but it has to be oiled regularly so it does not dry out. Also, wood can't be worn in the shower because it might expand in your ear... ouch! There are many wood styles out there including concave saddle plugs, eyelets and hanging designs. Bone and horn - Plugs made from bone and horn are typically produced from animals killed for their meat, not just killed for their bones to make jewelry. Because it's an animal by-product, it is NOT vegan-friendly. Bone and horn needs to be oiled often because it can dry out. Like wood, it can't be worn in the shower or it may expand. They're a good choice for body jewelry because they can be carved into many different shapes and styles. Titanium - This super-light metal can be polished or colored (known as anodized) and comes in many different styles, from eyelets to plugs to hanging designs and captive bead rings. Stainless steel - This polished metal looks cool in your ears, but beware, many people have reactions to it! It can be made into many different styles like screw-on tunnels, solid plugs with etched designs and captive bead rings. 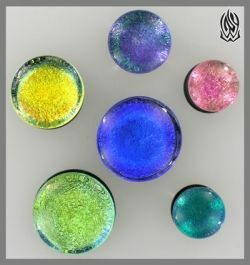 The plugs I like best to wear in my stretched ear piercings are known as "dichro" glass. This word is derived from "dichroic," which is a type of glasswork. It's pronounced "di crow." The reason I love dichro glass so much is its aesthetics. To me, dichro is one of the most beautiful things I can put in my ears. Another great reason dichro is great for your ears is the fact it's made with glass, which is smooth and typically doesn't give people allergic reactions. Dichro glass can either be single flared or double flared. Different manufacturers make all different colors of dichro, so they can be worn by guys or girls. There are some widely accepted materials that you should NEVER wear in your ears! As a rule, most people do not recommend acrylic in your ears. Yes, it's upsides are that it can be super-cheap to buy and it comes in really cute designs... but, most people are allergic to acrylic. If you're not allergic now, you may develop the allergy by wearing it in your ears. You'll know you have a reaction if your ears smell worse than usual (sorry! ), if they itch a lot or if your ears become wet while wearing them. You ESPECIALLY don't want to wear acrylic in holes you've just recently stretched, as the material can "form" to your ears (ouch!). The same goes for silicone in FRESH-STRETCHED ears only. It's usually safe to wear otherwise, unless you know you're allergic to silicone! Any materials that feel rough in your hands are no good for your ears! If you have stone or wood plugs that feel rough on the surface, DON'T WEAR THEM! If you insist on keeping those plugs, you can buy a super-fine sandpaper and try to sand the wearable surface yourself instead. If you're looking for a place to buy some quality plugs, try Amazon. Pair of Arang Wood Rosebud Plugs: 1/2"
Go ahead and leave me a comment. New to stretching my ears, had no idea hat acrylic is that bad. 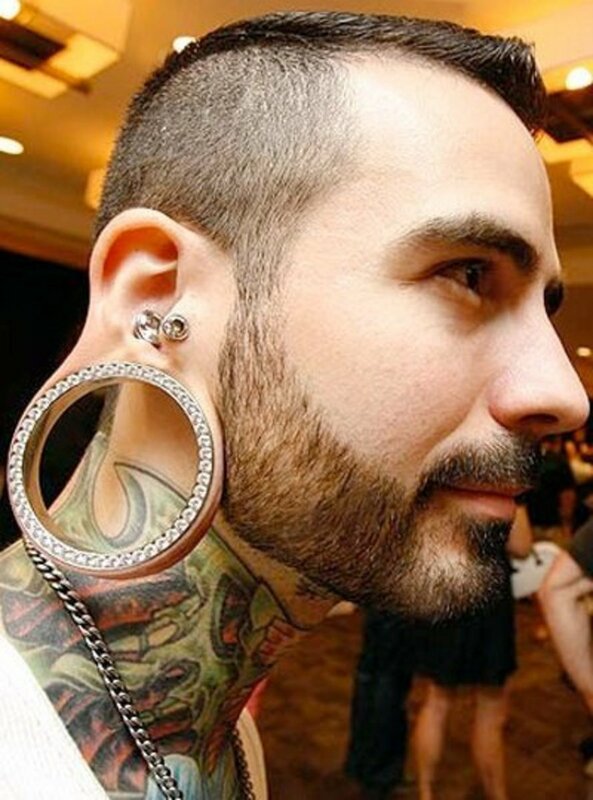 Gonna invest on some plugs and tapers of different material. the areng wood doesn't bother your ears? my ears have been stretched for more than half my life & i have had some wood plugs that were my favorites and never bothered me and others that made my ears itch terribly. i can't seem to find the kind of wood that didn't bother my ears - any suggestions on woods for sensitive skin? 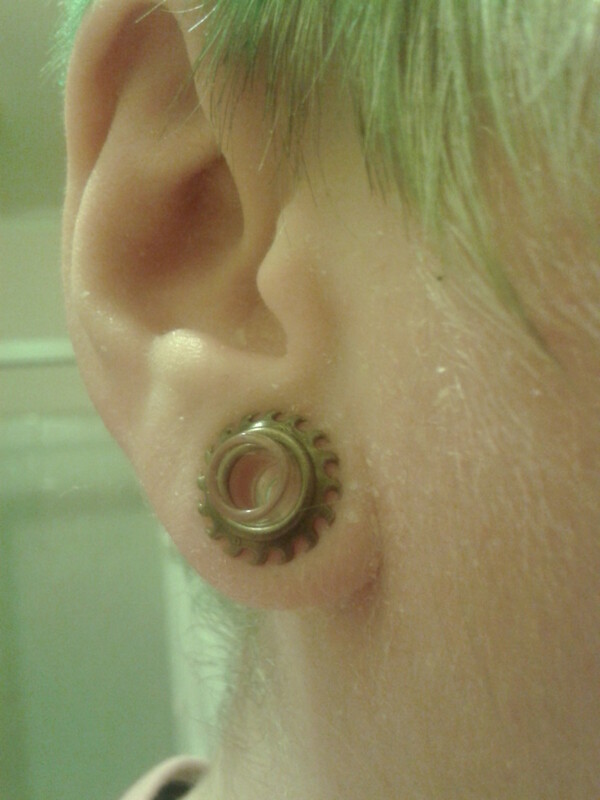 but I LOVE ploymer clay gauges/plugs. they come in beautiful designs on etsy and they are porous so they do not make your ears smell! @anonymous: Glass is absolutely safe for long-term wear! As long as the glass is smooth (not matte, rippled or jagged) and you do not have any adverse reactions (wet ear holes, itching, redness, hot to the touch) then it should be absolutely fine. I've been wearing glass in my ears for over ten years and haven't had any isses. If you're wearing bullet-holes (tunnels) then of course it may not be as safe than solid glass just because it could break easier. 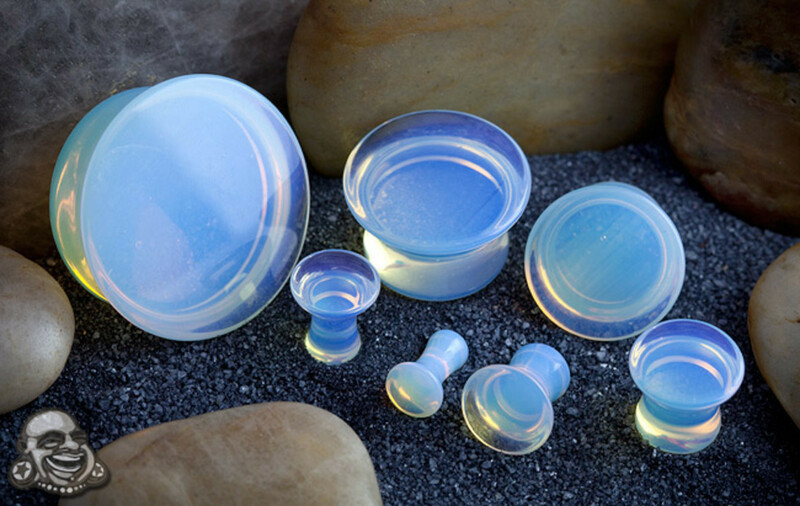 But overall, solid glass plugs are super-safe and as I said before, not many people show negative effects of wearing them... even for long periods of time. Happy stretching! Some places I've been reading, it said that glass isn't safe for long-term wear. Is it, or is it not? Well done! I am not in the market but will share with others who may be. Hi :-) Sign my guest book!